Born in Austria, she emigrated to the US in 1956. She worked in hospitals but also pursued a career as a singer. She eventually gave up singing because "I got a lot of publicity but very little money." She began painting in 1978 during her rehabilitation following a stroke. Bertha generally paints the same subject- a pig tailed, blue-eyed Statue of Liberty, surrounded by the goings on in New York City, usually including the Goodyear Blimp and Mets baseball player John Franco, and a helicopter. On the painting she puts the date of the Statue of Liberty (10-1889_ as well as the dates from when she was working on the individual piece. She frames her own paintings and always covers the back of each work with pasted and taped photocopies of old newspaper clippings dealing various recitals she has given including one at Carnagie Hall. 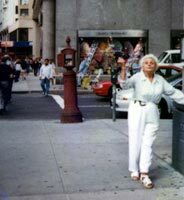 For years she set up outside and sold her paintings to the public on a Manhattan street corner usually around 51st Street near the building in which she lives. Very uplifting and inspiring Outsider paintings always with respect to New York City, the home of "Good People".